Instead of just finishing off the tail end of my linen purse warp in a timely fashion; I decided to use my stashed; handspun in Nepal nettle yarn, to make a loopy scrubby cloth. 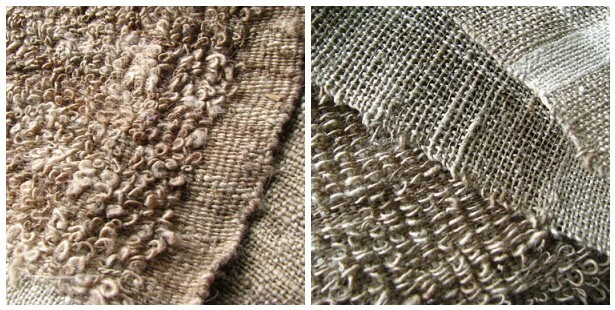 This was calling to me after reading about a “spa cloth ” on one of my favorite emagazines called weavezine. After an hour plus…plus? of loopy madness I decided I loved the effect, but this will not be an item that I would be willing to sell. There is just not enough time in m world for that. So that was fun, but in the end I am just procrastinating from getting inventory built up for an upcoming featured artist spot at VIVA Gallery for the month of November. Carole Austin, another weaver (hopefully more productive than I);and Nick Smolten; a damascus metal worker, will be sharing the featured artist spot with an opening celebration from 5-7 on November 5th. Come and join us, I think I will get some pictures printed and have more of a virtual show, if I don’t get busy soon. This looks very exciting! I love the loopy surface. Is the nettle yarn actually spun from nettles, the nasty weed that grow around barns and in gardens? I've used that yarn before! I loved it. The texture that you're creating is sublime. I love the way it looks in tabby, too. Keep playing! 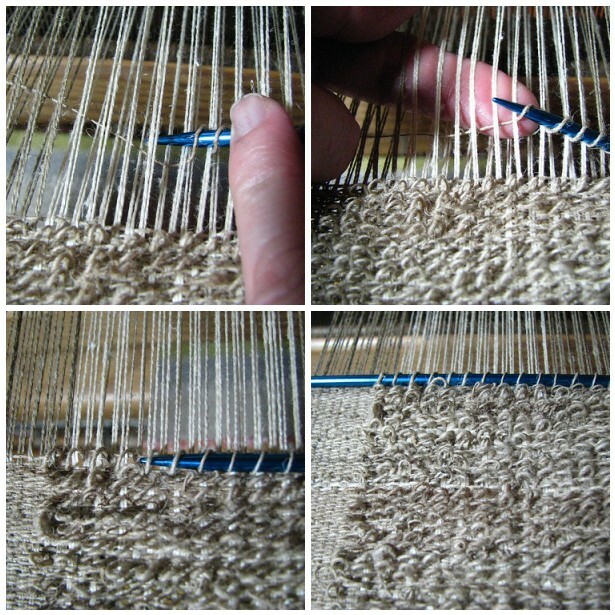 I really enjoyed the pictorial of the loop making! Thanks.. I might try to make some of the scrubby cloths for hubby as he likes a good loofah in the shower. While I don't have nettle yarn, I do have some good linen for this!